The structure of the renal corpuscle. The renal corpuscle in the cortex (outer layer) of the kidney. At the top, the renal corpuscle containing the glomerulus. The filtered blood exits into the renal tubule as filtrate, at right. 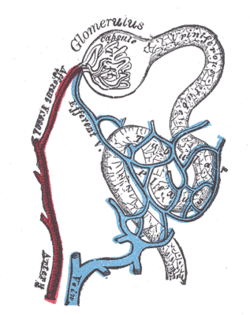 At left, blood flows from the afferent arteriole (red), enters into the renal corpuscle and is filtered in the glomerulus; blood flows out of the efferent arteriole (blue). A renal corpuscle is the blood-filtering component of the nephron of the kidney. It consists of a glomerulus - a tuft of capillaries composed of endothelial cells, and a glomerular capsule known as Bowman's capsule. The renal corpuscle is composed of two structures, the glomerulus and the Bowman's capsule. The glomerulus is a small tuft of capillaries containing two cell types. Endothelial cells, which have large fenestrae, are not covered by diaphragms. Mesangial cells are modified smooth muscle cells that lie between the capillaries. They regulate blood flow by their contractile activity and secrete extracellular matrix, prostaglandins, and cytokines. Mesangial cells also have phagocytic activity, removing proteins and other molecules trapped in the glomerular basement membrane or filtration barrier. The Bowman's capsule has an outer parietal layer composed of simple squamous epithelium. The visceral layer, composed of modified simple squamous epithelium, is lined by podocytes. Podocytes have foot processes, pedicels, that wrap around glomerular capillaries. These pedicels interdigitate with pedicels of adjacent podocytes forming filtration slits. The renal corpuscle filtration barrier is composed of: the fenestrated endothelium of glomerular capillaries, the fused basal lamina of endothelial cells and podocytes, and the filtration slits of the podocytes. This barrier permits passage of water, ions, and small molecules from the bloodstream into Bowman's space (the space between the visceral and parietal layers). Large and/or negatively charged proteins are prevented from passing into Bowman's space, thus retaining these proteins in the circulation. The basal lamina is composed of 3 layers: lamina rara externa, lamina densa, and lamina rara interna. The lamina rara externa is adjacent to the podocyte processes. The lamina densa is the central layer consisting of type IV collagen and laminin. This layer acts as a selective macromolecular filter, preventing the passage of large protein molecules into Bowman's space. The lamina rara interna is adjacent to endothelial cells. This layer contains heparan sulfate, a negatively charged glycosaminoglycan that contributes to the electrostatic barrier of the glomerular filter. There are two poles in the renal corpuscle, a vascular pole, and a urinary pole. The vascular pole is a location of the glomerulus. At the vascular pole, the afferent arterioles and efferent arterioles enter and leave the glomerulus in the Bowman's capsule. The urinary pole is at the other end opposite to the vascular pole. At the urinary pole, the proximal convoluted tubule arises. Fluid from blood in the glomerulus is collected in the Bowman's capsule to form "glomerular filtrate", which is then further processed along the nephron to form urine. A renal corpuscle is also known as a Malpighian corpuscle, named after Marcello Malpighi (1628–1694), an Italian physician and biologist. This name is no longer widely used, probably to avoid confusion with a Malpighian corpuscle in the spleen. Glomerulus is red; Bowman's capsule is pink. ^ J., Tortora, Gerard (2010). Principles of anatomy and physiology. Derrickson, Bryan. (12th ed.). Hoboken, NJ: John Wiley & Sons. p. 1024. ISBN 9780470233474. OCLC 192027371. Wikimedia Commons has media related to Renal corpuscle. This page was last edited on 6 February 2019, at 09:30 (UTC).